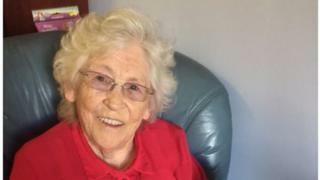 I met Joan Porter this time last year when I visited her in the sheltered housing complex where she lived in East Dunbartonshire to film an item for BBC Scotland news. Despite having been recently diagnosed with Alzheimer's, the 85-year-old was just about to have her first books published. The children's stories that Joan wrote down more than 40 years ago were published as a Little Terry Tiddlemouse series. On Sunday, the beloved mother, grandmother and great grandmother passed away. When I met her, she was sharp, sprightly and slightly bemused to find herself at the centre of so much attention. Her youngest daughter Arlene, who found the handwritten stories in a biscuit tin and posted them off to a publisher, was on hand to prompt Joan. Due to her dementia, she needed a little help with recent events, but her memories of the stories she made up decades earlier were crystal clear. She recalled working as a nurse on a children's ward, where she invented tales on the night shift for children who were missing their mothers and their homes. She based the stories on the wildlife and nature around Kilberry, in Argyll, where she grew up and raised her own family. Little Terry Tiddlemouse and his countryside friends were a part of that landscape, and her stories, which she read to her own great grandchildren that day captured in verse that idyllic countryside. It was that which captivated her publisher, Islay-based Ailsa Press, and led to various invitations, including the Tarbert Book Festival last autumn, which includes the landscape where she grew up. Joan was suitably modest about it all. She couldn't fathom who might want to read her books beyond family and friends, but she could see how her debut as an author at the age of 85 might be an inspirational story in itself. As a result of the coverage, she received many requests for interviews, invitations to book festivals, and even a request to give a lecture at St Andrews University. Letters arrived weekly at her home. Her family set up a Facebook page where they gave regular updates on Joan's late blossoming writing career. It was there they broke the news that Joan had died last weekend. They said: "She was the gentlest of souls who saw the good in everyone and everything, with the warmest heart, the heartiest laugh and the kindest smile. "We all miss her dearly, but her legacy lives on in all her grandchildren and she will never be forgotten." And the legacy of a great grandmother who proves that a good story stands the test of time, and you're never too old to do anything you set your mind to.